At ProLight+Sound in Frankfurt CADAC exhibited a full range of analogue and digital sound production consoles, from the bespoke, hand built J-Type to the complete CDC8 digital mix system. Together with the CDC Four and LIVE1 compact designs, and the highly configurable S-Type analogue series, the product range offers the legendary CADAC sound quality across the full range of live and installation sound applications. 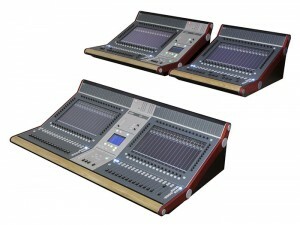 The company also ran demonstrations of its CDC8 and CDC Four digital consoles. It exhibited the extended CDC8 mix system, comprising the CDC8-32 and ultra-compact CDC8-16 frame size consoles, the CDC8-16S expansion sidecar and 32/16 and 64/48 I/O stage racks featuring CADAC’s proprietary, high speed MEGACOMMS network protocol. The CDC8-16 is a 16 fader, single touch-screen control surface variant with an ultra-compact footprint but identical 128 channel I/O configuration, functionality and processing power to the 32 channel model. The CDC8-16S offers an additional 16 faders and touch-screen control surface, connectable with a single Ethernet cable. The CDC Four is being shown with the new CDC I/O 3216 expansion rack. The CDC Four digital and LIVE1 analogue compact consoles offer an unrivalled combination of sound quality, channel count and performance at highly competitive price points. The S-Type is a classic large format CADAC analogue desk, exceptionally flexible and customisable, in terms of I/Os, channel strips, groups, VCAs and frame sizes. The CADAC J-Type represents the pinnacle of the company’s analogue console development and the engineering heritage shared by all consoles that bear the mix CADAC marque.